Last year our Curator Julian Stray gave a public talk on Mail Trains; this is now available to download as a podcast. The talk looks at the long and often strained association between the Post Office and the rail companies. Both underground and over, in sealed vans and Travelling Post Offices, mails have been conveyed, sorted and accelerated since 1830. Suffering the occasional mishap or celebrated by film makers (such as in the film Night Mail), the carriage of mail is considerably reduced today. Julian Stray’s talk touches on what went wrong, what changed, and why. The talk is based on extensive primary research completed for the upcoming joint BPMA/Shire publication Mail Trains. Download or subscribe to the BPMA podcast by visiting our website or through iTunes. 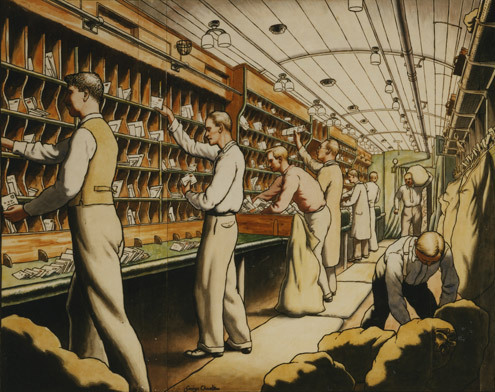 Visit our website to view a selection of items from our collection on the theme of Mail by Rail. This entry was posted in Podcast, Postal History and tagged General Post Office, GPO, mail train, mail trains, Night Mail, Post Office, railway, railways, Royal Mail, Travelling Post Office. Bookmark the permalink. I love the idea that mail was being sorted on the move in a train carriage through the night. Such a far cry to todays system. Love the poster a real piece of postal nostalgia.